The first incarnation of the band, "Mr. Crowe's Garden," named after Leonard Leslie Brookes children's book Johnny Crow's Garden, began in 1984 in Marietta, Georgia. Influenced by contemporary local acts like R.E.M., 1960s psychedelic pop and classic southern rock, they gradually evolved into a revivalist band dedicated to 1970s-era blues rock. Although the band has had a high turnover rate throughout their history, the driving force behind the band has always been brothers Chris and Rich Robinson who initially formed the band while attending Walton High School. The first professional demo the Robinson brothers did was for A&M Records in 1987. The band's manager at the time, Dave Macias, got in touch with A&M rep Aaron Jacoves, from Los Angeles, who offered the band a 'demo' deal and arranged the band's first of several demo sessions. It was held at Steve Gronback's studio in Carrboro, North Carolina. They were paid $2,000 by Jacoves to cover production costs. Jeff Sullivan (of Drivin' 'n' Cryin' fame) played drums on the first demo, while subsequent demo recordings featured Steve Gorman on the drums. Steve Gorman played on the subsequent A&M demos in Carrboro, N.C. during mid and late 1987, although as a guest drummer at first until he officially joined Mr. Crowes Garden later that year. The band was originally offered a record deal in 1987 under the label "Dog Gone" by Jefferson Holt (of R.E.M. fame) but held out. They eventually met George Drakoulias through A&M, when the band was playing as a quartet later in New York City at a club called "Drums." The band also played at CBGB's in New York later in 1988. Drakoulias turned the band on to music it had not heard before like The Faces and Humble Pie. Up until then the band did not cover Stones songs and Rich did not play in open-G tunings for Mr. Crowe's Garden songs. The band released its first studio album, Shake Your Money Maker, in 1990. Supported by singles "Hard to Handle," "She Talks to Angels," "Jealous Again," "Twice As Hard," "Sister Luck," and "Seeing Things," the album received multi-platinum certification and eventually sold more than five million copies. Their cover of Otis Redding's "Hard to Handle" and acoustic ballad "She Talks to Angels" both achieved top 30 positions on the Billboard Hot 100 in 1991. The band opened for ZZ Top on a tour sponsored by Miller Beer, from which they were fired in March 1991 after Chris Robinson's verbal tirade aimed at Miller. The band launched its own tour that May and later took part in a Monsters of Rock tour in Europe, where they opened for Metallica, AC/DC, Mötley Crüe and Queensrÿche. After replacing guitarist Jeff Cease with Marc Ford from blues-rock power trio Burning Tree, the band released its second album The Southern Harmony and Musical Companion in 1992. The album debuted at number 1 on the Billboard 200. The effort spawned the singles "Remedy," "Sting Me," "Thorn in My Pride" and "Hotel Illness," all of which topped the Billboard Album Rock Tracks chart. "Remedy" and "Thorn in My Pride" also charted on the Hot 100 in 1992. Because of the prevalence of studio musician (and former Allman brother) Chuck Leavell's piano and organ parts on the first release, the band hired a keyboardist of its own, Eddie Harsch. He became a permanent member of the group beginning on the "High as the Moon" tour. In 1994, the now six-piece band released Amorica after scrapping the unreleased album Tall the previous year. The album eventually achieved Gold status, selling over 500,000 copies. The cover featured a picture of a woman's crotch wearing a US-flag thong with visible pubic hair, which was taken from a 1976 issue of Hustler magazine. As some stores would not carry the album because of the cover, a different version was released simultaneously with a solid black background, showing only the triangle. Three Snakes and One Charm was released in July 1996. The band's support tour included a summer stint with the 1997 Furthur Festival, along with Ratdog, Bruce Hornsby and others. During this period, the band recorded an album called Band, which was scrapped. Guitarist Marc Ford was fired and bassist Johnny Colt subsequently left the group, dissolving the Crowes lineup of the previous three albums. The unreleased tracks from Tall and Band surfaced among tape trading circles and were later officially released on The Lost Crowes (2006). The band regrouped, adding Sven Pipien on bass prior to its next recording sessions. By Your Side was released in January 1999; the album stripped away the more adventurous sounds of Amorica and Three Snakes and One Charm in favor of leaner, soul-influenced songs. Guitarist Audley Freed, formerly of Cry of Love, joined prior to the recording of By Your Side but was not included in the recording sessions. In October 1999, the band was joined by Led Zeppelin guitarist Jimmy Page for two pairs of shows in New York and Los Angeles, and also Worcester's Centrum Centre, Worcester, MA, USA on October 16, 1999, yielding a live release, Live at the Greek on TVT Records. Due to contractual issues with Columbia, Live at the Greek did not feature any of the band's songs performed with Page. The collaboration led to a more extensive tour with Page and The Who in summer 2000, during which Pipien was replaced by Greg Rzab. Following the tour, singer Chris Robinson married actress Kate Hudson, before heading back to the studio to record the band's sixth studio album. In May 2001, the band released Lions on Virgin mogul Richard Branson's V2 record label; the album peaked at number 20 on the charts. The band launched its support of the album with the month-long Tour of Brotherly Love with Oasis and Spacehog in May and June 2001. Throughout the rest of 2001, the band embarked on the "Listen Massive" headlining tour in support of Lions, which spanned Europe and Japan before concluding with 36 US shows. The band effectively dissolved in January 2002 with the departure of drummer Steve Gorman and an announcement that the band was "taking a hiatus." A live album pieced together from two 2001 shows performed at Boston's Orpheum Theatre was released in August 2002. In 2004, some members of the band did reunite to play "Sometimes Salvation" with Gov't Mule at the 2004 Jammy Awards. During the hiatus, Chris Robinson released albums New Earth Mud in 2002 and This Magnificent Distance in 2004. Meanwhile, Rich Robinson formed a short-lived band called Hookah Brown before releasing his own solo album, Paper, in 2004. In early 2005, the Robinson brothers and Eddie Harsch reassembled the band, bringing Marc Ford and Sven Pipien back into the fold and in the absence of founding member Steve Gorman, recruited drummer Bill Dobrow, from Rich's solo band. Dobrow's tenure was short-lived, however, as Gorman rejoined the band[clarification needed] during a four-night stand at The Tabernacle in Atlanta. The reinvigorated band continued to tour throughout 2005, including a summer tour opening for Tom Petty and the Heartbreakers and five nights at The Fillmore in San Francisco. The second show at The Fillmore was filmed in high definition and released later in 2006 as Freak 'n' Roll into the Fog on DVD, Blu-ray and audio CD. In fall 2006, Eddie Harsch and Marc Ford left the band. Replacing Harsch and Ford were Rob Clores and Paul Stacey, respectively. In August 2007, the band replaced Clores with Adam MacDougall. Stacey's tenure was never intended to be permanent and when the band invited guitar player Luther Dickinson from North Mississippi Allstars to perform on their upcoming record, entitled Warpaint Dickinson officially replaced Stacey as guitarist. Stacey continued to work with the band, however, as producer of Warpaint. A live album entitled Live at the Roxy, culled from the 2006 Brothers of a Feather performances (featuring Chris and Rich Robinson performing mostly acoustic sets) was released on July 10, 2007. The album featured performances of old and new Black Crowes material mixed with covers, taken from a three-night run at The Roxy in Los Angeles in early 2006. The Black Crowes' first album since reforming, Warpaint, was released on March 3, 2008. Warpaint was critically acclaimed and the album landed at number 5 on the Billboard 200, the band's best debut since The Southern Harmony and Musical Companion topped the charts. The band launched an international tour March 24 when they played the East Coast Blues & Roots Music Festival in Australia. The band continued its Australia and New Zealand tour — the first since 1992 — through April 5, before departing for a European trek. A US tour began in May and concluded in December with another five-night stand at The Fillmore in San Francisco. Also that year, the Black Crowes filed a lawsuit against country singer Gretchen Wilson, claiming that she infringed upon their copyright for the song "Jealous Again". In April 2009, the band released a two-disc live album entitled Warpaint Live. The first disc consists of the Warpaint album played in its entirety, while the second disc is made up of catalog classics and cover selections. The entire performance contained on the set was recorded on March 20, 2008, at the Wiltern Theater in Los Angeles. A DVD of the same performance was released on June 30, 2009. The band released its eighth studio album, Before the Frost...Until the Freeze, later that year. A CD purchase of the album is accompanied with a download code to receive the album's companion release, ...Until the Freeze. The vinyl version is a double album that includes all of the songs but in a different running order. These albums resulted from five days of recording at Levon Helms Studio in Woodstock, and presents a combination of new material and a few new cover songs recorded live in front of an audience. Continuing the trend set with the previous album Warpaint the Crowes incorporated more of their country and bluegrass roots in these recordings as well as venturing into new avenues such as disco in the song "I Ain't Hidin'". A DVD of these sessions, including some interview and backstage segments, was released named Cabin Fever. On April 21, 2010, the band announced an August 3 release date for a double, all-acoustic album Croweology, as well as tour dates for the "Say Goodnight to the Bad Guys" tour, which featured two 90-minute sets at the majority of shows: one acoustic and one electric. After the tour, the band went on another "indefinite" hiatus. On November 26, 2010, the Black Crowes released a special edition Record Store Day Black Friday 10" vinyl picture disc w/download card called, Say Goodnight to The Bad Guys/Remedy (acoustic live) for independent record stores. After ending the U.S. tour at The Fillmore in December the Crowes played nine Goodnight to the Bad Guys shows in Europe in July 2011. These included festivals in Italy, Spain, the Netherlands and Belgium, as well as a few headlining shows where, comparable to the US tour, they played a 90-minute acoustic and 90-minute electric set. The final four shows included two in London (the second of which featured a Jimmy Page-led encore), followed by two that saw them return to Amsterdam's Paradiso. On December 25, 2012, it was announced that the Crowes would embark on a five-show UK trek in March 2013, followed by a 21-date US tour from April to early May. Instead of Luther Dickinson, Jackie Greene would play guitar and provide backup vocals. On March 19, 2013, the band released its fourth live album titled Wiser for the Time. The album was released as a digital download and as a four record vinyl set. The album was recorded during the band's 2010 series of concerts in New York City. On April 23, 2013, the Black Crowes returned to their hometown of Atlanta and played at The Tabernacle in front of a capacity crowd. In July 2013, the band kicked off a tour with the Tedeschi Trucks Band. In December 2013, the band returned to hiatus. On January 15, 2015, Rich Robinson announced the final breakup of the band due to a disagreement with his brother Chris Robinson over an alleged proposal regarding ownership of the band. In an interview, drummer Steve Gorman indicated that prior to the breakup, the Black Crowes had been discussing a tour. 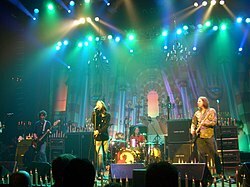 Following the Crowes' most recent breakup, band members moved on to other musical projects, some of which were active prior to the bands disbandment. Chris Robinson has continued performing with the Chris Robinson Brotherhood, a band he formed in 2011 which also includes Adam MacDougall. He released his third studio album with them, Any Way You Love, We Know How You Feel, in 2016, followed by the EP "If You Lived Here, You Would Be Home By Now" later the same year. In 2017, the CRB released "Barefoot In The Head." The CRB has also released 4 Live Albums, "Betty's Blends Volumes 1, 2, 3", and "Betty's Midwestern Magic Blends." Chris Robinson has performed a few solo acoustic shows during which he played several Black Crowes songs, including "Hotel Illness" and "Bad Luck, Blue Eyes Goodbye." In 2018, Chris Robinson formed the band "As the Crow Flies" which performs songs from the Black Crowes catalogue. Robinson noted, ‪“‬I’m not out to redo the Black Crowes or outdo the Black Crowes or anything like that. I just want to sing the music.” The band includes former Crowes Audley Freed and Adam MacDougall, Marcus King, Andy Hess, and Tony Leone. Rich Robinson has continued his solo career, recording his fourth solo album, Flux, in 2016. In late 2016 he announced the formation of The Magpie Salute which also includes former Black Crowes members Marc Ford and Sven Pipien. The band performs original songs, Black Crowes songs, covers, and selections from Robinson and Ford's solo careers. The band released a live album, The Magpie Salute, in 2017, and their debut studio album, High Water I, was released on August 10, 2018. "High Water II is due for release in 2019. Steve Gorman has continued to perform with Trigger Hippy, a band he co-founded in 2009 (which also featured Jackie Greene until late 2015 when he left to focus on his solo career). Former keyboardist Eddie Harsch died November 4, 2016, at the age of 59. ^ a b "Billboard Artist Chart History". Billboard. Retrieved 2008-02-23. ^ "The Black Crowes Bio, History, Info on JamBase". jambase.com. ^ "The Greatest - Show Cast, Episodes, Guides, Trailers, Web Exclusives, Previews - VH1.com". vh1.com. ^ "The Black Crowes Bio – The Black Crowes Career". MTV Artists. ^ Morse, Steve (March 23, 1995). "The Black Crowes: Rock rebels take home-grown spirit on tour". The Boston Globe. p. 18. ^ Christman, Ed (10 December 1994). "What is all of this Crowe-ing about Amorica censorship". Billboard. p. 74. Retrieved 11 May 2010. ^ "The Lost Crowes". ArtistDirect. Retrieved 2008-04-22. ^ "Black Crowes' Chris Robinson Marries Kate Hudson". Yahoo! Music. Retrieved 2008-04-22. ^ "Billboard Artist Chart History". Billboard. Retrieved 2008-04-22. ^ "THE BLACK CROWES' CHRIS ROBINSON On His Brother RICH: 'We Never Really Had Much Of A Relationship'". Blabbermouth.net. February 21, 2015. ^ ""BEFORE THE FROST...UNTIL THE FREEZE" OUT AUGUST 31". Blackcrowes.com. Archived from the original on 2009-08-13. Retrieved 2010-04-07. ^ "THE BLACK CROWES TO RELEASE DOUBLE STUDIO ALBUM OF ALL ACOUSTIC MATERIAL TO COMMEMORATE THEIR 20th ANNIVERSARY". Blackcrowes.com. Archived from the original on 2010-04-23. Retrieved 2010-04-19. ^ "Page". Record Store Day. Retrieved 2011-07-06. ^ "THE BLACK CROWES End Hiatus". Blabbermouth.net. 2012-12-25. Retrieved 2012-12-25. ^ "Tedeschi Trucks, Black Crowes talk about joint tour". recordonline.com. 2013-07-27. Retrieved 2013-08-08. ^ "The Black Crowes Are No More, Says Guitarist Rich Robinson - Blabbermouth.net". BLABBERMOUTH.NET. ^ "Rich Robinson Announces The Black Crowes Have Broken Up". JamBase. January 15, 2015. ^ "Steve Gorman Addresses Black Crowes Breakup". Jam Bands. 16 January 2015. Retrieved 2 May 2015. ^ "Anyway You Love, We Know How You Feel". The Chris Robinson Brotherhood. 2016-07-29. Archived from the original on 2016-11-04. Retrieved 2016-11-05. ^ "Chris Robinson announces new band As the Crow Flies, shares tour dates". Consequence of Sound. Retrieved 2018-12-04. ^ "AS THE CROW FLIES KICK OFF TOUR WITH HIT-HEAVY SHOW". Ultimate Classic Rock. Retrieved 2018-12-04. ^ "FLUX TO BE RELEASED JUNE 24, 2016". Rich Robinson. Retrieved 2016-11-05. ^ Hudak, Joseph (2016-10-17). "Rich Robinson Forms Magpie Salute With Ex-Black Crowes". Rolling Stone. Retrieved 2016-11-05. ^ "Jackie Greene Quits Trigger Hippy". Jambands.com. 2015-07-26. Retrieved 2016-11-05. ^ "Eddie Harsch, Former Keyboardist of The Black Crowes, Passes Away". Jambands.com. Retrieved 2016-11-05. ^ Kaufman, Gil (November 4, 2016). "Former Black Crowes Keyboardist Eddie Harsch Dies at 59". Billboard. Retrieved February 6, 2017.